I saw the original stage production of “Fences” in its inception when it opened at the Orpheum Theater in San Francisco in 1987. As riveting as the story was, that experience was all about the commanding and inimitable stage presence and resonant, booming voice of James Earl Jones in the lead role. When Jones took a forceful step toward another character on stage, I instinctively leaned back in my chair. There are few specifics I remember about the production other than Jones, but the visual of the last moments of the powerful ending, which was changed by the time it hit Broadway, is still fresh in my mind. I also remember leaving the theater thinking, however impressed I was by the play, that it wasn’t a story that was conducive to a film adaptation, primarily because it was limited to a single set with few characters. 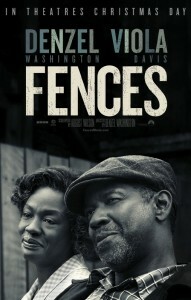 Adapted by August Wilson from his own Tony Award, Drama Desk Award and Pulitzer Prize-winning play, “Fences” is set in a depressed black neighborhood in 1950’s Pittsburgh.1 Troy Maxson (Denzel Washington) is a sanitation worker and former baseball player whose playing days were long behind him by the time the major leagues included blacks, leaving him embittered. That anger pervades over his every day existence. A loving husband to his wife Rose (Viola Davis, like Washington, reprising her 2010 Tony-winning role), Troy is a stable provider. His bitterness is nonetheless focused on his high school football-playing younger son, Cory (Jovan Adepo), and Cory’s aspirations to go to college on a football scholarship. Cory’s attempts to nurture a healthy relationship with Troy and win Troy’s approval prove repeatedly fruitless and it’s implied their relationship has always been like that. In and out of the story is Troy’s brother, Gabriel (Mykelti Williamson), a WW II veteran whose battle injuries resulted in a plate in his head and the residual unstable behavior that repeatedly lands him in jail. All the love and trust Troy shared in his 18-year marriage with Rose is betrayed by an infidelity which ultimately seals the fate of his marriage and already-tenuous relationship with Cory. The movie hadn’t gotten more than two minutes into the story (and the opening credits hadn’t yet finished) when I felt I was witnessing a great stage performance on film by Washington, a trait shared by Russell Hornsby, who plays Lyons, Troy’s son from another woman. Specifically, I’m referring to the rhythmic, poetic delivery by both actors, which sounds great but doesn’t serve the context of a film. Washington especially has scene after scene of mini-soliloquies where it doesn’t seem like he has a chance to take a breath. I can’t fault Washington; I’m not sure that much condensed dialogue could have been delivered any better. Still, it seems as though Washington can’t escape the trappings of his stage performance. It’s paradoxical that the perfection of that delivery is distracting and takes away from any attachment we try to make to the character and story. It’s befitting that Lyons is a musician since Hornsby’s delivery is melodic. We welcome any time the dialogue baton is handed to any of the other actors, especially Davis, who deftly draws us back into the story like a life preserver we subconsciously wait for. When Troy speaks, we’re impressed by the acting; when Rose speaks, we care about the character and the sequence of events. The only films I’ve seen Davis in are set in the 1950’s (“Far from Heaven”, “The Help”) or 1960’s (“Doubt”) and “Fences” adds to that list of great performances. A device she uses in John Patrick Shanley’s 2008 “Doubt” to bring realism to her performance, a runny nose that emphasizes the emotional intensity of the moment, is used again in “Fences.” In both instances, I wanted to hand her a tissue myself so we could get on with the story. It’s to Davis’ credit that her familiarity with the role from the stage production doesn’t overwhelm her performance here. Brit Adepo’s portrayal of Cory similarly serves the film better than Washington’s I’m-saying-words-written-by-someone-else delivery. Adepo’s physical boyishness is similarly well-suited for the developing but still-vulnerable character, especially any time Corey challenges Troy. Stephen Henderson (who also appears in “Manchester by the Sea”), in the role of Troy’s conscience and closest friend Jim Bono, toes the line between the two acting styles and does it well. Williamson’s character, while adding color to the story, doesn’t have much range, but neither would someone with a similar affliction under similar circumstances. Denzel Washington’s directing is competent if not color-by-numbers and lacking in subtlety, although the story wouldn’t benefit from anything more showy and the star of the show is the dialogue. While his portrayal is unquestionably engaging, I’m conflicted that a great stage performance won the SAG award and earned a Best Actor Oscar nomination. I also question Viola Davis’ Best Supporting Oscar nomination. Although I agree with her nomination (and SAG win) in terms of the quality of the portrayal, Rose is clearly a lead character. Once her name is called on Oscar night, the category won’t matter; Viola Davis will be an Academy Award winner. 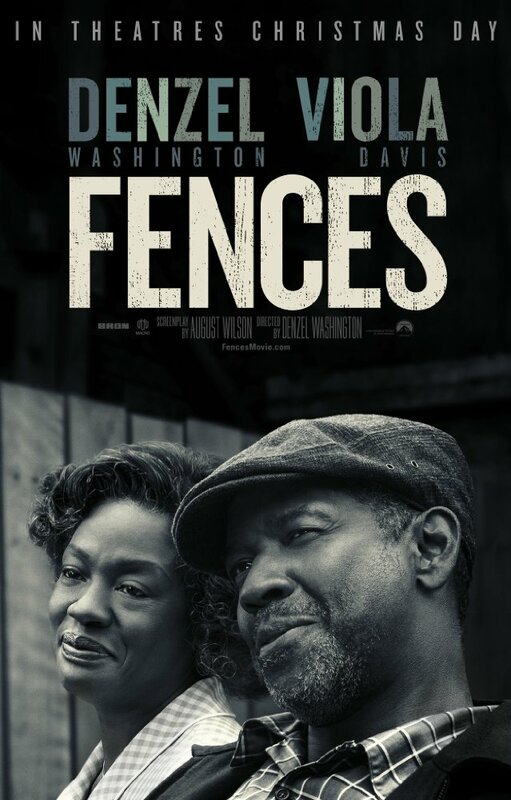 For me, “Fences” is both deja vu and something new, as elements are added to the play — which was stark and simple by comparison — in its transfer to screen. It took almost 30 years to bring an outstanding story to the screen and, for all my criticisms, the wait is well worth it. It’s long overdue such a compelling and powerful tale finally gets the wide audience it deserves. I don’t know if the comparison has ever been made, but it never occurred to me until just now that “Fences” is the black “Death of a Salesman.” I don’t think I can come up with a higher compliment. 1 Tony Kusher (“Angels Over America”, “Lincoln”) completed the adaptation (also up for an Oscar, as is the film) after Wilson’s death in 2005 but is not credited for it. He is instead given a co-producer credit. When Rose says “From right now this child got a mother, but you a womanless man”, I relived the moment I heard that powerful double-edged line the first time in the original play (from Tony Award-winner Mary Alice). I had completely forgotten about it, but hearing it in the film really took me back. The audience reaction (a combination of a collective gasp and a “whooooo”) was as powerful as the line itself, and it all but stopped the show. The original play before it hit Broadway went to black before the final scene, then shined a spotlight where the baseball hung, the spot we associated with Troy. The narration/voice-over poetically implied Troy had died and the play ended. The deafening silence as we filed out of the theater was all the funeral procession the play and audience needed. In the context of the stage play, that ending worked well and, after the final confrontation between Troy and Corey in the film goes to a slow fade to black, we are fleetingly given the impression the film ends there. I choose to believe that moment is a nod to the original, more potent, provocative and poetic ending.